DRmare Spotify Music Converter for Mac, as one of the best Spotify streaming music converter, is specially designed to help Spotify users losslessly extract and download any Spotify track, album, artist and playlist from DRM-ed OGG Vorbis to common MP3, M4A, AAC, FLAC, WAV and M4B formats for offline playing on any device, such as Sony Walkman, SanDisk Sansa, Creative Zen, iRiver, Zune, iPod, PSP, etc. With this smart tool, you can download and convert all Spotify music files even without subscribing to Spotify Premium. 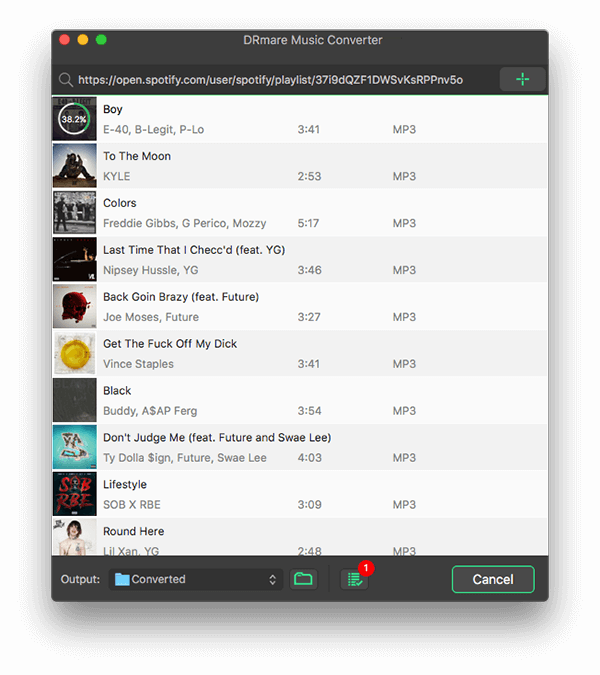 Thanks to its advanced decrypting technology, DRmare Spotify Converter for Mac is able to work at 5X faster speed while preserving the original ID3 tags, including title, conver, album, date, artist, and more. You are also allowed to set output parameters like bit rate, codec, audio channel, sample rate to make the music sound better. 1. Solved the problem that the output audio files might occur abnormal data.